In 1505, Pope Julius II called a much-admired Florentine sculptor named Michelangelo to Rome to create a huge, freestanding tomb with approximately 40 over-life-size marble statues, all to be made within five years. When the pope saw Michelangelo's design, he was so delighted that he dispatched the artist immediately to the stupendous marble quarries of Carrara, not far from the Italian coast in Tuscany, to find suitable stone. While Michelangelo was considering the landscape, he was seized with the idea of carving a colossus out of a mountain that would be visible to seafarers from afar (one presumes comparable to the great Colossus of Rhodes, one of the seven wonders of the ancient world). Although 94 wagonloads of marble were quarried and shipped back to Rome, the papal tomb was never completed according to the original plan. Neither was a gigantic figure ever carved from the mountain face by the shores of Tuscany. Michelangelo himself became the true Colossus of Tuscany. Sculptor, painter, poet, architect, and sincere Christian—he embodied the grand tensions, complexities, uncertainties, and achievements of his era. His name is synonymous with the glory of the Renaissance. Michelangelo Buonarroti was born on March 6, 1475, in the tiny town of Caprese in the Apennine Mountains. He was the second of five sons of Lodovico di Lionardo Buonarroti Simoni, then 167th Florentine Podestˆ (commissioner) of that town. Just months after the birth of Michelangelo (who was named after an archangel), the family returned relatively impoverished to the Santa Croce district of Florence, where for centuries they had claimed residence and ancient nobility. Soon Michelangelo was sent to a wet nurse, a daughter and wife of a stonemason. In jest he always claimed to have imbibed with her milk the desire and propensity for shaping stone. Savonarola became the leader of a Florentine republic for a brief time, but eventually he was excommunicated, tortured, charged with heresy, hanged, burned with two other followers in the main piazza of Florence, and his ashes dumped in the River Arno. Yet the memory of Savonarola's writings, even “the living voice” of his sermons, never left Michelangelo. The friar's criticism of the church's moral decay and external ceremonies and his preaching of salvation by faith continued to echo in the artist's mind. In these impressionable early years, the scene was set for a lifelong war in his soul between perfect physical beauty and perfect spiritual goodness. As Savonarola was being consigned to the flames in Florence, Michelangelo was well on his way to the highest ranks of ecclesiastical patronage in Rome. A French cardinal commissioned a Pietˆ. For this memorable work, which Michelangelo completed in 1499, he combined the conventional artistic theme of the Virgin Mary mourning over the dead body of Jesus with a classical style to create one of the most stirring yet serene works of devotional art in history. Julius II, the warrior pope who put on armor and rode off to do battle for Italy and the Holy See, proved to be one of Michelangelo's most supportive —and cantankerous—patrons (a relationship immortalized by Charlton Heston and Rex Harrison in the 1965 film, The Agony and the Ecstasy). Michelangelo had barely finished a few individual statues for the proposed tomb when Julius had a change of heart, possibly because he had heard that it was bad luck to make one's own tomb while still alive. He ordered Michelangelo to decorate the ceiling of the Sistine Chapel, built by his uncle Pope Sixtus IV. Michelangelo initially resisted this assignment, objecting that “painting was not my art.” He was already deeply invested in the tomb project and anxious for it to proceed. However, the sculptor reluctantly traded his chisel for a paintbrush. To be sure, Julius was not easily satisfied. “It really ought to be retouched with gold,” he complained. “It will look poor.” Not relishing the idea of rebuilding the scaffolding, Michelangelo answered, “Those who are depicted there, they were poor too.” The ceiling stayed the way it was. 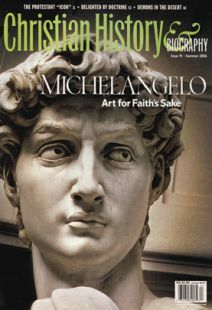 In the first few decades of the 16th century, while Europe was surging with radical religious reform and political unrest, Michelangelo was swamped with commissions that proved his skills not only as a sculptor and a painter but as an architect as well. A political republican, he even served as chief engineer of Florence's military defenses until Pope Clement VII and the Holy Roman Emperor Charles V suppressed the Florentine republic in 1529-30. In 1535, the new pope Paul III commissioned him to paint a depiction of the Last Judgment on the altar wall of the Sistine Chapel. Around the time he was painting The Last Judgment, Michelangelo, now nearly 60, met two people who would have a profound personal impact on his life and faith: Tommaso de' Cavalieri (1516-1574) and Vittoria Colonna (1492-1547). His poetry attests to the fact that he was no stranger to lust and guilt, whether from acts or thoughts alone. The conflict between his deep admiration for earthly beauty and his yearning for a love that transcended physical desires—“the tension between nature passionately loved and grace passionately longed for,” as Dixon puts it—was a source of tortuous inner struggles. However, as Michelangelo scholars John W. Dixon and James Beck have argued, there is no historical evidence that he ever had sexual relations with anyone, man or woman. He claimed he was married only to his art. Vittoria Colonna was Michelangelo's intimate link to a wide range of reforming currents from Rome to Geneva. The learned Marchesa (who was also a poet) was close to the pulsing center of a circle of reform-minded Catholics at Viterbo known as the Spirituali. She read a commentary on Romans by Juan de Valds and probably met the winsome Spaniard at his villa near Naples, where he gathered a group of the shakers and makers of his day around him to consider spiritual matters. Though he remained a Catholic, his ideas were not far from those of contemporary Protestant thinkers, especially concerning justification by faith. By the end of his life he had enough money to afford the luxurious lifestyle of other famous artists of the day, but instead he lived like a poor man. Though he rarely accepted gifts, he often gave away artwork to friends and in later years he provided dowries for poor girls otherwise unable to marry. In 1547, Paul III appointed the 72-year-old Michelangelo chief architect of the new St. Peter's Basilica in Rome. It was one of his last major public commissions and occupied him for much of the remainder of his life, though it would fall to others to finish building what he had planned. The replacement for the old Constantinian basilica had gone through the hands of several popes and designers and foundered in confusion. For the aged master, it was a matter of recovering truth to set things right. He made modifications to a previous architect's design and capped it off with a design for a dome that is today famous around the world. The voyage of my life at last has reached, amidst a stormy sea, in a fragile boat, the common port where one crosses to return, rendering account for every deed wicked or pious. So that the passionate imagination that made art an idol and sovereign to me, I now recognize well how it was laden with error like all things men desire against their interests. What will become of my amorous thoughts, once happy and vain, as two deaths approach me? The one I know certainly, the other threatens me. Neither painting nor sculpture now can calm the soul turned toward that divine love that opens his arms on the cross to take us in. The Colossus of Tuscany worked right up to the end. Though seriously weakened, he was still carving the poignant Rondanini Pietˆ until days before his death on February 18, 1564, less than a month before his 90th birthday. In the hour of his death he desired his friends only to remember the death of Christ. Laurel Gasque is a cultural historian, author, and lecturer who works with faculty and graduate students for InterVarsity Christian Fellowship of Canada. Michelangelo's frescoes in the Sistine Chapel make a profound statement about the creation story— and the artist's own creativity.